That´s how we created a space where people can live, share ideas and exchange experiences about travelling while also falling in love with photography. We even have our own gallery where guests can browse through or purchase photographs. That’s our hostel. So if you can to stay at a chilled, familiar and cozy boutique hostel, this is definitely your place. 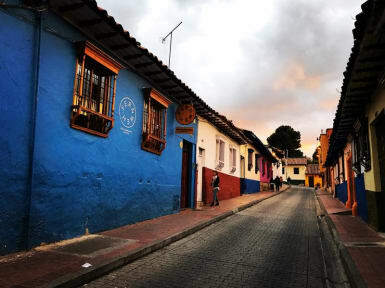 Fernweh Photography Hostel is situated in the charming area of downtown Bogota known as La Candelaria. We are 3 minutes from “El Chorro de Quevedo”, 7 minutes from the main square of Bolivar, as well from the most important museums such as: Museo Botero and Museo del Oro, among others. Payment upon arrival by cash, credit cards, debit cards. (This property may pre-authorise your card before arrival). Taxes included. By far the best place I stayed at during my travels. Super comfy beds, lovely common areas, perfect location in the nice neighborhood of Candelaria. The owners are experienced travelers, not just helpful but very interesting people. Andy knows Colombia really well, a mine of information for your trip. The idea of the bonefire in the garden at night is brilliant cause it allows you to get to know everyone in the hostel. Ideal for solo travelers that are looking for socialising over partying.